Claudia Piñeiro’s latest novel is billed as a taut thriller from Argentina’s bestselling crime writer. While A Crack in the Wall is certainly a good book, it seems less a crime novel, and more a commentary on one man’s experience of an unfulfilled life. Opening with Pablo Simó’s lamentation on a murder he was involved with several years ago, any substantial tension is immediately dispersed. Instead, the reader is taken through the day to day life of Simó as he argues with his wife and struggles to find fulfilment in his work. It is not until the sweet and beautiful Leonor takes an interest in him, that he realises how much he has given up for the sake of maintaining a family life. 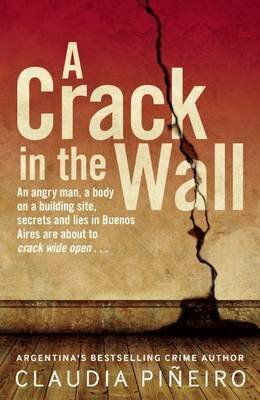 Alongside this, Piñeiro weaves in the story of a murder which started with a crack in the wall. This aspect of the story is more mysterious than thrilling, though it still makes for an interesting plot line. However, it is the characterization which stands out in this book, rather than the plot. By the end of the novel, the reader feels they have gone on a journey of self-discovery with Simó, the awkward, aging architect who gave up on his dreams long ago.